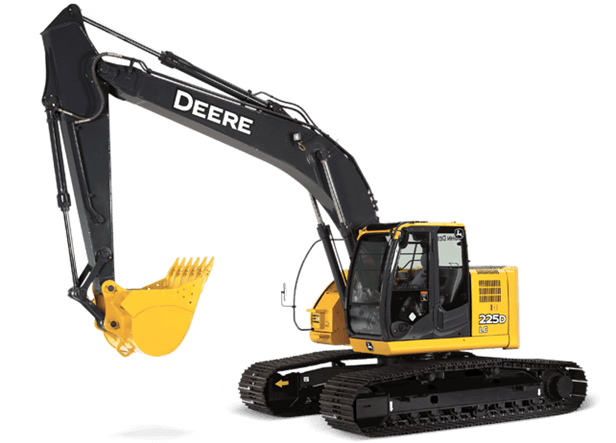 Whether it's urban renewal, interstate work, or underground utilities, the 225D LC will arm you for top productivity. It delivers impressive swing torque, drawbar pull, and lift capability, with low emissions and noise. Its reduced-tail-swing design allows it to rotate freely within a small radius, so it is more productive around obstacles or in confined spaces. Run long and hard, too, with a rugged diesel engine certified to EPA Tier 3 emissions, a more efficient cooling system, and a beefier undercarriage delivering long-lasting durability. The quieter, more spacious cab offers ample legroom and noticeably more glass; comfort and visibility are unsurpassed. All the power, smoothness, ease of operation, and comfort you'd expect from John Deere excavators in an easy-to-maneuver package.